In the latest episode of We’re Only Human, I explore talent mobility and its applications in the workplace. Talent mobility is the practice of using internal talent to fill temporary or permanent roles. Unlike succession, which is typically a top-down approach, talent mobility takes into account the interests and aspirations of employees. As a talent practice, the idea of talent mobility isn’t necessarily new. However, there is renewed interest in the topic due to some interesting trends covered in the podcast, including changes in career longevity, employee ownership over career paths and work tasks, the gig economy, and challenges with sourcing high performers. In addition, I examine some case studies and examples of companies that are doing interesting work with talent mobility, including World Bank Group, Chipotle, and Hootsuite. 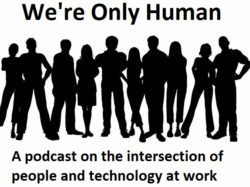 As a reminder, you can subscribe to We’re Only Human and all the HR Happy Hour Podcast shows on iTunes, Stitcher Radio, and all the major podcast player apps – just search for ‘HR Happy Hour’ to subscribe and never miss a show! This entry was posted in General, Podcast and tagged Case Study, HR Podcast, Succession Planning, Talent, Talent Management, Talent Mobility, We're Only Human on December 7, 2016 by Ben. I realized this weekend that I didn’t let you guys know about a free webinar I’ll be doing tomorrow with RecruitingBlogs. If you’re interested in joining me for the session you can sign up here. Talent mobility. If you’re not familiar with the term, it’s the practice of using internal talent to fill roles as well as creating new paths and opportunities for your staff. It has a whole host of impacts and benefits. Recruiting: instead of immediately looking externally for talent, you consider your internal talent inventory to determine if you have someone you can move into the role. Retention: by using internal staff for filling positions, you increase retention and drive satisfaction for career-minded employees (this used to be Millennials, but I’ve heard stories of all types of workers fitting this bill). Learning and development: instead of putting someone in a class, you give them an experiential/social learning opportunity by plugging them into a new environment. In the webinar I will be talking about some companies that have made talent mobility a priority, from Chipotle to Hootsuite and World Bank Group to Tata Consultancy Services. Each case study tells a slightly different story, and I’m excited to share those examples. In addition, we’ll look at some different sources of research on the topic that allow us to dig deeply into why this talent process matters. The research I’m doing these days around gig workers and the talent economy (I’ll be sharing some info on this in my next post) points to the fact that people want more control over their own careers and development. With that in mind, giving them flexible opportunities to contribute, grow, and develop just makes sense if we want to not only engage them, but keep them long term. If that sounds interesting, I’d love to have you join. I try to make my webinars fun and entertaining (lots of stories) while still giving you some actionable takeaways. This entry was posted in General and tagged Career, Recruiting, Talent, Talent Management, Talent Mobility, Webinar on November 7, 2016 by Ben.